(18 May 2012) The 16th New Zealand Ice Cream Awards were announced in Napier on Thursday, 7th June 2012. What a line-up of entries for this year's New Zealand Ice Cream Awards! 285 entries - a record number that kept the 5 judges engaged for a full two days judging. There was also a record number of 37 entrants compared to 31 last year. The individual categories which attracted the largest number of entries were Premium Ice Cream with 55 entries, Gelato with 56 entries and Sorbet with 50 entries. Following on from its introduction last year, there are two Supreme Awards awarded to the best ice creams over 9 different categories. This ice cream was Best in Category for Standard Vanilla Ice Cream and judges described it as true to type with good colour and matching flavour. Supreme Award for a Boutique Manufacturer this year was awarded to an entry in the Gelato category. The winning entry was Salted Caramel Gelato made by Takapuna Beach Café and Store. The judges were impressed with the ability to balance the sweet flavour of caramel with just enough sea salt to enhance the overall combination of flavours in this gelato. Takapuna Beach Café and Store also won the Supreme Award last year for their Coconut & Lime Curd Gelato. · and the Premium Ice Cream Category with their Dark Chocolate. · the Low Fat Category with their Tip Top Creamy Yoghurt Ice Cream Strawberry. 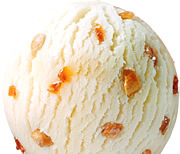 A new "Best of" category was introduced this year, and the first flavour to feature was New Zealand's iconic ice cream flavour, Hokey Pokey. This new category attracted 19 entries and it was enlightening for the judges to be able to taste a wide range of Hokey Pokey styles in gelatos, premium and standard ice creams, showing how this flavour really is one that New Zealanders identify with. Much Moore Hokey Pokey made by Kiwi Ice Cream Company Ltd was the winner of this iconic category. A new Award introduced for the first time this year was for the "Best New to Market" entry, where any entry new to retail in the last 12 months was eligible. A staggering 85 entries (30% of the total entries) were eligible for this Award, indicating how creative this industry is. The winner of the Supreme Award, Salted Caramel Gelato made by Takapuna Beach Café and Store also won this award. Ten children from Owairoa School in Howick were presented with 19 ice creams to determine the winner of the Kids Choice Category. Each of the children had to earn their place on the judging panel by completing a job application for a position as an ice cream judge. The lucky applicants had to wait an agonizing long holiday break to know if their application had been successful so were very keen to impress with their ice cream tasting skills, taking their role very seriously. The "Yum" to "Yuk" scale was used, with the boys having their clear favourite as well as the girls. Tramontana made by Patagonia Chocolates of Queenstown was the winner of the Kids Choice Category. It was encouraging to have a few more entries in the Export Category this year. The category was won by Talley's Group Ltd with their Green Tea Ice Cream that is destined for Japan, which was described by the judges as having a clean and refreshing flavour. To challenge the judges, the Open Creative categories in ice cream and gelato/sorbet included some clever and different flavours. In the ice cream category these included avocado and goats cheese, plum and horopito, japonica and prune and spices. Equally as creative were the Open Creative Gelato/Sorbet entries with Irish stout, black sesame, violet and saffron and nougat sorbet. Too difficult to pick an overall winner across the two sections of the Open Creative category - joint Best in Category winners were selected: Malt Chocolate Ice Cream made by Ginelli's and Italian Black Licorice Gelato made by Pacific Flavours & Ingredients Ltd. The main judging of the New Zealand Ice Cream Awards was undertaken during the second week of May at the Massey University campus, Food Technology Department in Albany, Auckland. The Chief Judge, Kay McMath and her team of four judges took two full days to judge the large number of entries split over the 11 categories. Judging involved awarding points for a number of key attributes in different properties. Appearance was worth 10 points, Body and Texture - 30 points, Flavour - 50 points and Melting properties - 10 points. Gold Awards were given to entries with more than 95 points, Silver Awards to those between 90 and 95 points. A full list of the 2012 Awards is here. Photos of the 2012 Awards presentations and winners here. 2012 New Zealand Ice Cream Awards category winners and full list of Awards. Photos from the 2012 NZ Ice Cream Awards presentations and Deco Dinner, June 7, Napier. Telephone +64 4 385 1410.